Looking forward to having the application in steam when you guys sort out a way to upgrade the license. Does this mean we will have to pay again just to download it on steam? @PapaFrancis: Don't worry, you won't have to pay the full price again. We haven't worked out all the details yet, so stay tuned. Please don't 'improve' your licensing. I like it the way it is. I'm not a gamer. I absolutely am not installing Steam on my computer. @Andy: Don't worry, we're not changing anything about our existing licensing, we've just added the Steam license as an option. If a friend comes over and uses their logon for steam for an hour or two, will that remove the layout? No, you won't lose any settings, DisplayFusion runs independently from Steam once it's installed. You can change Steam logins temporarily without affecting DisplayFusion at all. If I buy it on Steam, which license am I buying? "Pro Standard" or "Pro Personal Home"? It's actually a new license type that is very similar to the Personal Home license. You can install it on as many computers as you want, as long as they're yours and you're using Steam on them. I was waiting for this event to finally make my purchase. Using multiple monitors has been a bit messy. Steam Big Picture helped out some, though it hasn't been perfect. From all the features I've seen, I'll have everything I'll need to have my gaming experience just the way I like it without having to resort to Big Picture unless I absolutely want to. 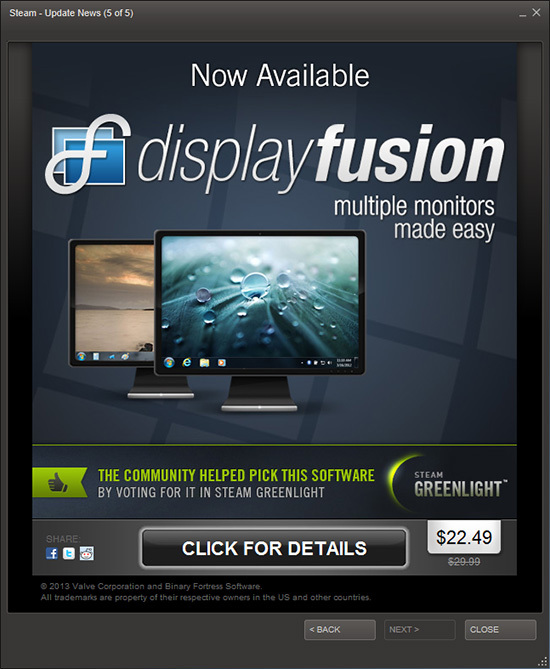 If I buy DisplayFusion on steam will I still get WallpaperFusion Pro? Or will I have to buy DisplayFusion on your website to get that? I've always loved DF and am very happy with my copy. It's always the first thing I install in a new build after AV. Since I use Steam a lot, I'd also like to get the version integrated with Steam as long as the cost is nominal. If I get a steam license can I manually enter the license into Displayfushion instead of installing steam? If I can't, if I uninstall steam after I install displayfusion does the license get removed? You'll need to install it through Steam, but after it's installed, Steam doesn't need to be running in order to use DisplayFusion. So then what is the benefit of purchasing the steam license as opposed to a pro personal home license? It seems like the features are identical and both licences allow me to install DF on any personal computer. Yet, the steam license is $5 cheaper and adds another layer of complication by ensuring the computer has steam installed. @Eric: The Steam license can be used on multiple computers in multiple locations (home, work, etc) as long as they are your computers, or you are the primary user, and you have Steam installed. The Personal Home license is for multiple computers in your house, and can be used by different people in your house. Steam is so much flexible in terms of pricing policy, for my region it's ~12$ cheaper! @Alex: That's good to hear, we try to provide as many ways as possible for people to purchase DisplayFusion.